Previously, I wrote about my introduction to Native American people, aka Indians. Now I will tell you the rest of the story. As a dedicated young cowboy, interested in the American West, I enjoyed family trips to places like Fort Robinson, where Crazy Horse was assassinated, and the Black Hills, sacred to the Sioux. 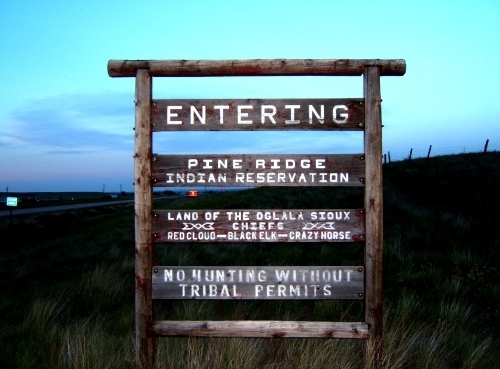 The Pine Ridge Reservation is in South Dakota on the border of Nebraska. We visited Wounded Knee in the Pine Ridge. So, when I had to pick an 8th grade history project, I wrote about American Indians and learned a lot in the process. Later, during my higher education, I signed up for a class called “Concentration in Cross Cultural Communication” because it included a three week field trip as part of the requirement. Some of my classmates went to Africa. I arranged to go to the Pine Ridge Reservation. In preparation, I read Dee Brown’s book, Bury My Heart At Wounded Knee. Unfortunately, at the time I was to go there in the spring of 1975, the American Indian Movement folks like Russell Means had a standoff with FBI agents and took some hostages. So, I was told that it was not a good time to visit. Instead, I redirected my field trip to New Mexico, where I stayed at Ghost Ranch near Abiqui. I was there three weeks. I visited the seven northern Pueblos, including the Taos Pueblo. I enjoyed the experience, meeting some nice folks and learning a lot. As it turns out, many years later, I still enjoy northern New Mexico. My trophy wife, Miss Sugar, and I frequently make trips to Santa Fe, Taos, Abiqui and Ojo Caliente. Miss Sugar has made friends with some artisans in that area and gets materials such as turquoise and silver to use in her own jewelry making business. She likes the SouthWest stuff. So do I. Actually, our log house on the ranch is decorated with cowboy decor, including SouthWest items. Plus, I use guns and antlers in much of my decorating. Fortunately, Miss Sugar shares, no, improves upon my taste in decor. Of course, there is a good reason why. Not only did she grow up in Texas, but she is an Indian princess, no less than 1/16th Shoshone. Get a load of that. That first powwow became my destiny.